Honda improved The Fireblade for the year 1994 just slightly . In comparasion tests that year was put together Suzuki RF900, Kawasaki ZX-9R and Triumph Daytona 900, everybody appreciated how the Fireblade ran like sport-touring machine . Probably most remarkable change was rebuilt front section with more rounded lights. Shape improved aerodynamics. The engine stayed without changes, but original piston cover head was replaced by magnesium one. Power output was the same - light power delivery in bottom but a lot of power in midlle and upper range. There were different things which moved possibilities of 1994 Fireblade forward. Bike had still front 16'' wheel and was still a little bit unstable but changes in this year includes undjusted gearbox and wider rear tire 180/55 instead of former 160/55 so unstability was decreased. 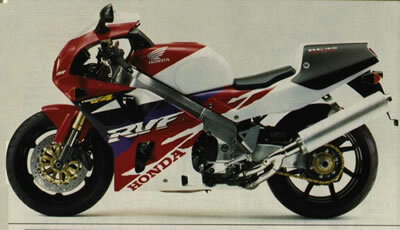 Even riders who dreamed about the VFR750 saw the potential of the RR because it was comfortable over longer distances. The price was increased but in spite of thisd all Fireblades were sold immediately.